Paddle boarding is not just fun, it also brings in a series of health benefits. Sure, nothing is more relaxing and entertaining than paddling with some friends after a long week at work. However, it's worth noting the health advantages too, especially as there are people out there who paddle to actually keep in good shape. In this article, we will be discussing on is stand up paddle boarding a good exercise? What does paddle boarding tone? At some point or another, pretty much every muscle in the body is worked on. For instance, you need to learn how to maintain a perfect balance. Your legs will have to take most of the tension while you stand up, as they need to stabilize your body. On the other hand, paddling involves using the shoulders, back and arms. The balance is also maintained by keeping your core and abs flexed. From this point of view, a little relaxation will prove to be a good paddle board core workout. If you're new to paddle boarding, it's perfectly normal to experience some soreness the next day. It will go away within a few days though. However, this is a good sign. It means your body strength is improving. You took a workout, so your muscles are recovering and growing stronger, hence the painful sensations. Things that seem hard today will prove to be a piece of cake in a few weeks. 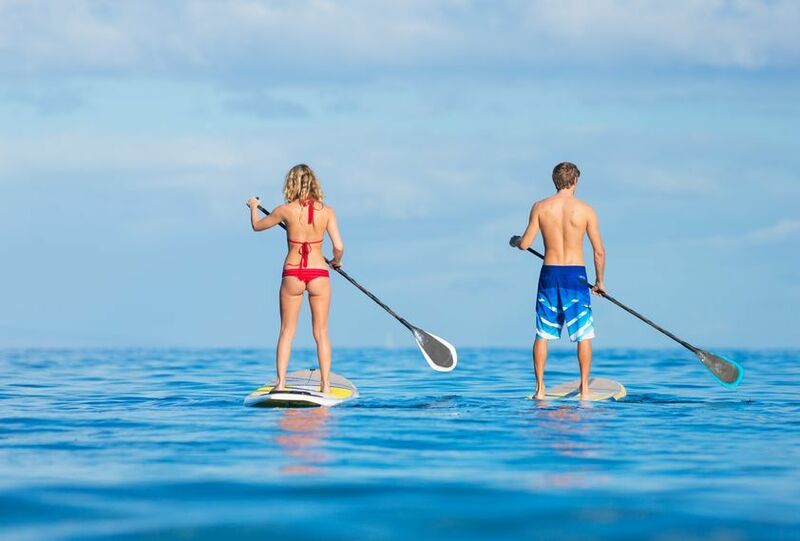 The SUP fitness benefits target your heart as well, so a little paddling will make a great cardio workout. Your heart rate goes up due to the extra effort. Heart muscles grow stronger and pump blood in a more efficient way. If you want to make it more intense but exciting at the same time, try racing your friends or family. Knowing how to prepare for paddle boarding depends on why you engage into such activities. If you're up for some fun in the water, you only need basic accessories, as well as whatever feels comfortable. However, some people paddle in order to recover after injuries. Paddling is a low impact workout, so it can increase personal strength without causing any harm. It won't put too much tension on joints and muscles either, hence its popularity in rehab programs. Just like any other type of workout, paddle boarding is likely to burn calories and fat too. It's hard to tell the amount of paddle board workout calories you can burn in one hour because it depends on more factors. Generally speaking, the more intense your workout is, the more fat you'll burn. On average, you'll burn around 500 calories per hour if you don't take breaks. The key here is to get a paddle board that you love. Check this article out to find the best SUP in the market today. So, is stand up paddle boarding a good exercise? Definitely! It's not a high impact exercise for bodybuilders, but a solid workout for the average individual who wants to have fun while maintaining a good physique. Its low impact profile makes this exercise suitable to children, elders and even patients recovering after injuries.